A project to ship tons of trash to an Imperial County landfill via train could face a delay because of the economy. Los Angeles County Sanitation District’s waste-by-rail project start-up may be postponed, according to sanitation district officials. However, the project is still scheduled to be completed in 2013. Some trash that would have made its way down to the large landfill near Glamis may stay in Los Angeles as it’s cheaper to keep the trash rather than ship it. Prior to the recession, the price of taking trash to landfills in the Los Angeles area was dictated by the Puentes Hills Landfill, a landfill near Whittier that can accept all solid waste originating from within Los Angeles County, said Paul Prestia, section head of waste by rail section. However, private landfills are now soliciting waste from trash haulers in the area, and it’s cheaper than it would be to send it by train out of the area. That doesn’t mean that the waste-by-rail project is not going to continue, he said. That would especially be true if construction or manufacturing starts back up, as there will be more trash that needs a place to go, he said. For now, less than 4,000 tons can be brought to the Imperial County-based landfill by truck, and anything more than that will be brought by train once the line is finished, he said. Since there’s no way to control the economy, the sanitation district will continue to be ready to operate the rail line when the Puente Hills Landfill closes in October 2013, he said. Whether there will be waste there when the rail line finishes, there’s no way to know now. There’s already been so much money and work that has gone into the rail line and the Mesquite Regional Landfill that it doesn’t make sense not to bring trash to it, said Board of Supervisors Chairman Michael Kelley. 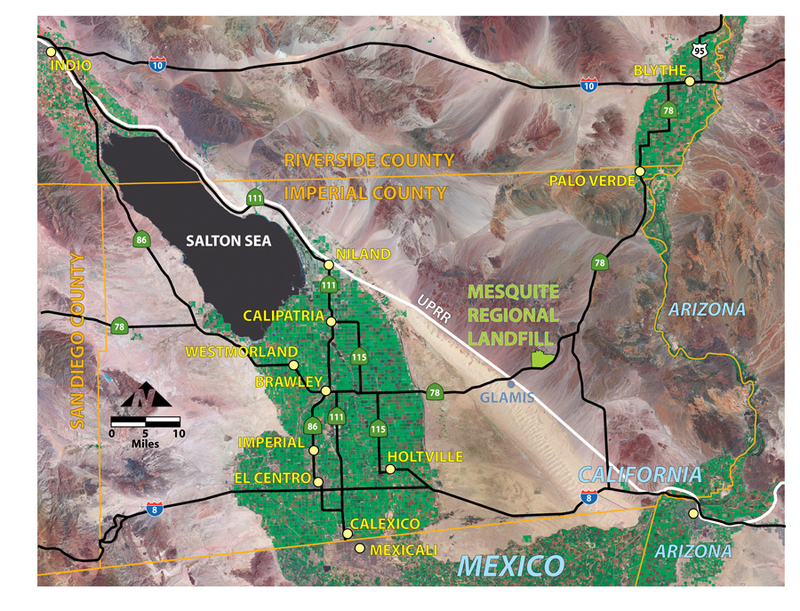 The Mesquite Regional Landfill, located next to the Mesquite Gold Mine near Glamis, is a 2,300 acre landfill with a total capacity of 600 million tons. 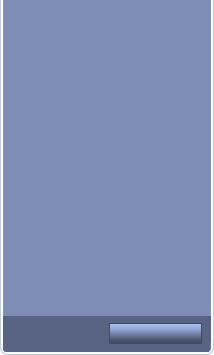 The maximum tonnage is 20,000 per day, with 1,000 tons per day reserved for Imperial County. The anticipated life of the landfill is 100 years. It’s a very sophisticated facility, Kelley said. Waste-by-rail is the most feasible way to go, he said. 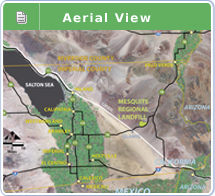 If it were trucked down, there would be more traffic and more danger on the roads to the landfill, as well as being a detriment to the Imperial County road system. 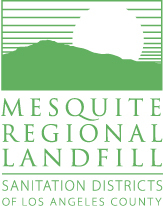 “Ultimately the Mesquite Landfill was built for a certain reason, and they’re going to use it,” he said. Staff Writer Elizabeth Varin can be reached at evarin@ivpressonline.com or 760-337-3441.